Right now, we have no upcoming scheduled events. Please check our site often for updates. C. Morgan Kennedy has a BS in Mechanical Engineering from Case Western Reserve University and an MBA from Otterbein College. Marketing and Entrepreneurship were her MBA focus. Throughout her more than twenty year career in Corporate America, she has worked in international and large account sales, corporate training, and product marketing. She is currently the Director Business Development for a $100 million global product portfolio. Ms. Kennedy is based in Portland, OR. Therese Patrick is an active member of RWA for ten years. For Rose City Romance Writers she was a past treasurer, on the newsletter staff, and has been a coordinator with the Golden Rose Contest teams since 2003. A former Business Operations Consultant and Technical Writer she was part of the start up team for a national electrical services company. Ms. Patrick is a mother of four daughters, lives in Oregon, writes contemporary romance and memoir. She is an active blogger since 2009 and is marketing both her fiction and memoir. Short Description: The Genuine Author Persona is who you are on the internet and in person – it is the Dynamic Core of all your marketing and promotions. Your Persona blends with your Books and creates a great experience for the reader. Expanded Description: Your Author Persona is the Dynamic Core of all your Marketing and Promotions. With an Author Persona created you have much more time to write as marketing and promoting your books should only be 10% of your time. Your Author Persona represents the enhanced YOU. It is YOUR public FACE and should be consistent for all of your marketing and promotions. You, as the author, in your professional Persona, can create an engaging experience for your reader at First Contact, and everything time. The design of your website and all marketing collateral should reflect the style and genre of your books. You choose the font and style for your name, and the color of the letters and background. Do not underestimate the shape and colors of the letters and background for promoting your persona. Your persona and presence on the internet is as important as a Great Cover and Blurb is for your books. Through four interactive exercises, in this workshop you will create your website banner and persona themes as the items that will withstand the test of time. You will create an Author Persona that will seamlessly market your books so anything you do on the internet has the potential of generating interest in you and making a sale. Short Description: Take control of your promotions using the three primary principles of marketing to work seamlessly to generate sales, and do it in only 10% of your writing time. Understand how your Author Persona is the dynamic core of your marketing plan to Push your products, Pull your readers, and create a Point-of-Purchase experience your audience will want to repeat. Expanded Description: All marketing is designed to generate SALES at the POINT OF PURCHASE. Invest your time and energy into a dynamic plan instead of tossing cash into gimmicks. Through interactive exercises you will learn how effective marketing should only take up 10% of your writing time – and how to make this work for YOU. The POP is the peak of the pyramid and the primary point of contact between the Author Persona and the Audience. With the internet and a targeted website, POP can take place 24/7 around the globe. The internet experience should be as engaging to the audience as a well planned promotional event with bonus material. The PULL of your marketing plan is your delivery on the promise of a great experience to your audience. Pay attention to what feels like a good online experience for you and mirror that for your readers. A dynamic interaction between an author and an audience is a beautiful thing. It creates a positive potential for shared communication, better stories, and greater sales. 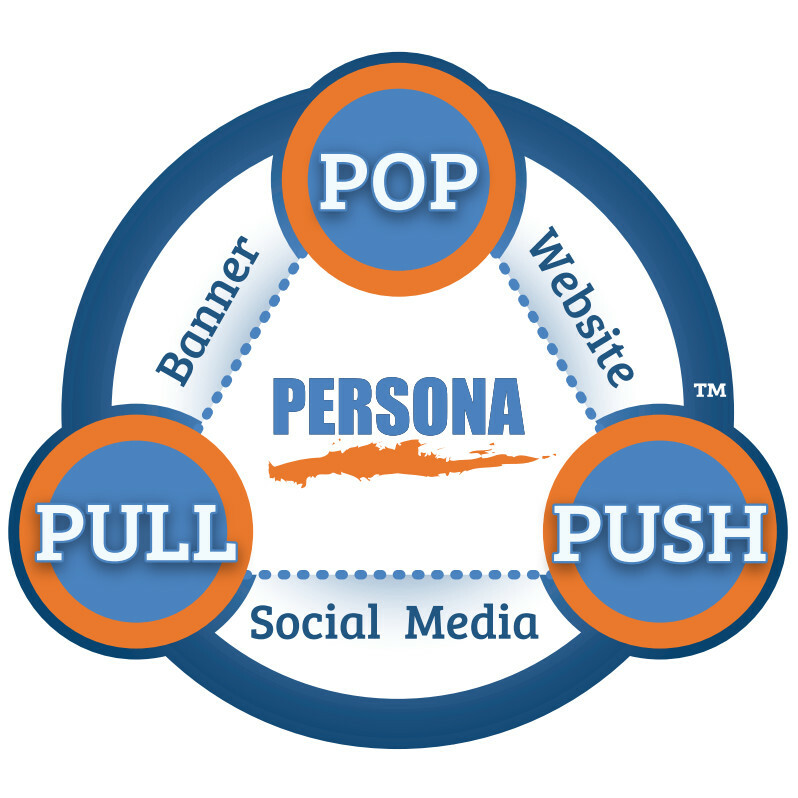 PUSH is promoting your books through your Persona, to specific target audiences. 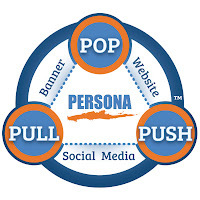 A good PUSH is another PULL to your Persona and Product and POP. This process is seamless and the basis of marketing.